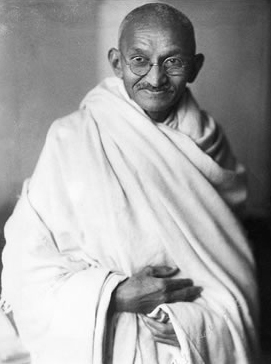 Posted by Adam Adshead in Conceptual BJJ, Inspiration, Mahatma Gandhi. Mahatma Gandh i once said ‘Be the change you want to see in the world’ and after reading that quote attached to a chamomile tea bag, I’ve been interested in how doing such a thing can positively affect the different factions of my life. In terms of BJJ, I think a useful idea that this quote rouses is the fact that you can set an example and tone that will carry out through the rest of your academy. If for instance you constantly ramp up the pressure and intensity when you roll, then other people will think it’s acceptable to do the same back. Now, if you’re a coach or senior athlete setting such an example will be magnified – as they say ‘Monkey see, monkey do’. So if you train at a club where things get a bit too heavy during rolls, then ‘be the change you want to see in the world’ – roll how you want to, don’t be drawn into playing any other way as you’re selling yourself short and only adding to the atmosphere. I have always been a light, fluid, mobile grappler and I know that by consistently setting such an example, even when I wasn’t a coach, that it helped influence, in some way, the athletes I’ve trained with over the years. ‘Be the change you want to see in the world’ as I’m sure we could all benefit from being more like a grappling Gandhi. Get Conceptual BJJ updates delivered by email. Just click the icon above or here and select 'delivered by email'. The Hunger site – free donations of food to crisis areas.